CPF - The Fatherhood Coalition is an all volunteer, non-profit organization of men and women advocating for the institution of fatherhood, encompassing the full range of human behaviors and endeavors that flow from the father-child relationship. We work to promote shared parenting and to end the discrimination and persecution faced by divorced and unwed fathers, in society at large and specifically in Massachusetts. CPF is active in all the arenas that impact the father-child relationship. We hold public events, conferences, protests, and rallies, and work the news media to raise public awareness about the importance of fatherhood and the epidemic of throwaway dads. Members are active within the courts fighting for justice and due process. We assist in legislative efforts promoting shared parenting, and work to correct the gross injustices that have worked their way into the state's law books. We produce literature and disseminate it to the public, the news media, and to elected officials. Fathers who need help in the courts are directed to pro se workshops where they learn how to best represent themselves. CPF was formed from a small group of non-custodial fathers meeting in Arlington, MA in December 1993. The group soon grew in size and moved to an office on Washington Street, Boston. In September of the following year they took their name, Coalition for the Preservation of Fatherhood. In 1995, the group moved to another office on Beacon Street (in 1999, the office was closed, but CPF expects to reopen at a new location soon). In 1996, they shortened their name to The Fatherhood Coalition, and use CPF informally. Since that time, the Coalition has begun to spread across the state. 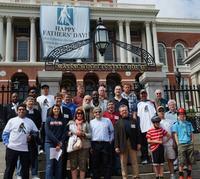 Besides forming an association with two pre-existing Massachusetts fathers/ children's rights organizations, Dads Against Divorce Discrimination (DADD) and Parents and Children Together (PACT), several CPF chapter affiliates are functioning at the local level in their communities. CPF also has an affiliation with the Maine DADS organization. Nature abhors a vacuum, and the need for an articulate voice to advocate for fatherhood has never been greater. We anticipate interest in the Coalition to continue to grow at the same or greater rate for the foreseeable future. CPF is governed at the state level by an elected board of directors and elected officers. Raising awareness of the social problems and harm to children caused by fatherlessness. 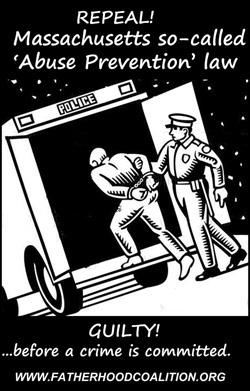 Reversing government laws and policies that promote fatherlessness. Restoring constitutional protections for fundamental rights in family law. Restricting state intrusions into the sanctity of the family. Contact a chapter of affiliate and get involved, or contact our main office.